Push button electric start and three-speed automatic transmission make this the perfect bike for learning. 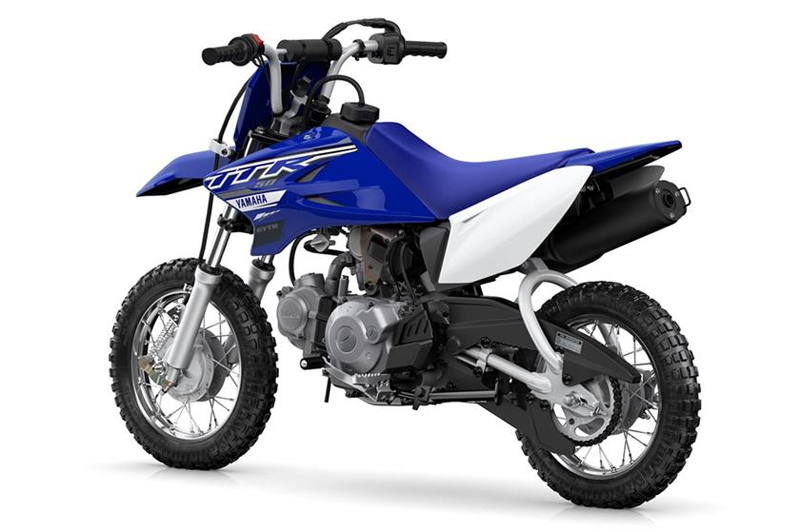 SIMPLE AND STRONG FRAME: Curved steel backbone frame keeps the TT-R50E narrow and has three engine-mounting points for excellent rigidity and handling. COMPACT INVERTED FORK: Inverted fork with 22mm sliders provides 3.8 inches of smooth front wheel travel for a great ride and handling. 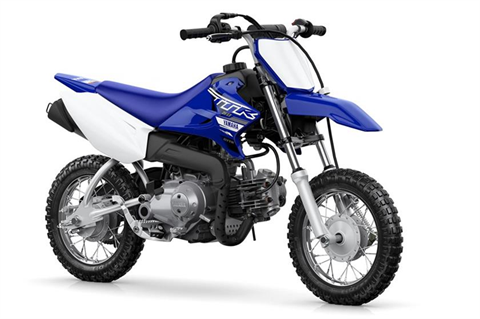 LIGHTWEIGHT SINGLE SHOCK: Monocross® rear suspension is controlled by a single coil-over shock and provides 2.8 inches of bump-smothering rear wheel travel. ENCLOSED DRUM BRAKES: Front and rear 80mm drum brakes deliver strong, dependable stopping power, and the rear’s activated by a right foot pedal just like the big YZs. 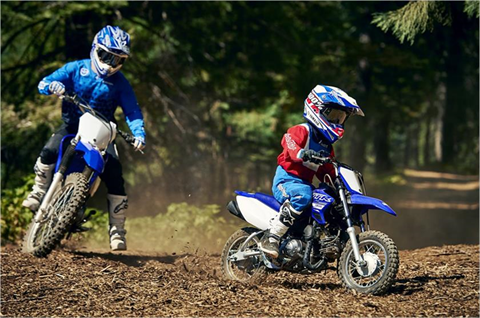 DURABLE KNOBBY TIRES: 10-inch front and rear wheels with knobby tires offer great grip and exceptional wear. ULTRA-LOW SEAT HEIGHT: Low, 21.9-inch seat height allows most kids to put both feet down for enhanced handling and added confidence. AUTOMATIC CLUTCH: Three-speed gearbox with automatic centrifugal clutch makes learning to shift gears a breeze. 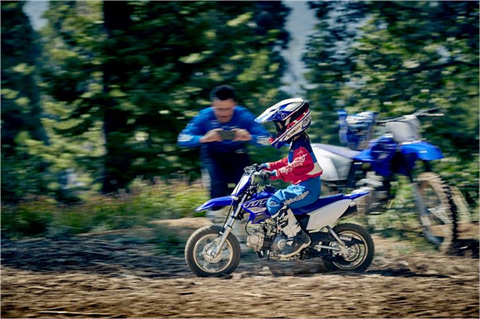 CONVENIENT ELECTRIC START: Convenient electric starter for effortless starting. COMPACT ENGINE: Compact-design cases keep overall engine width down for a narrow feel and great handling. RESPONSIVE POWER: 11mm Mikuni® VM-type carburetor with automatic on/off electric heater ensures crisp, dependable throttle response. LOW MAINTENANCE ENGINE: Automatic cam chain tensioner reduces maintenance. DIGITAL IGNITION: CDI ignition system delivers hot, reliable spark and requires minimal maintenance. 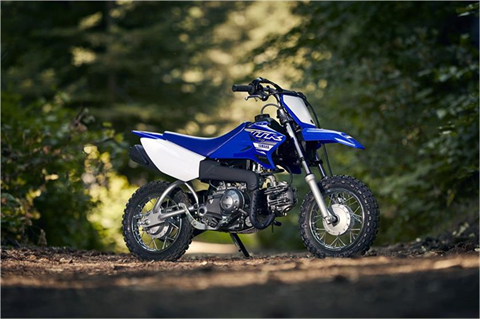 FORESTRY-FRIENDLY EXHAUST: Lightweight, upswept exhaust system is quiet and contains a USFS-approved spark arrestor. 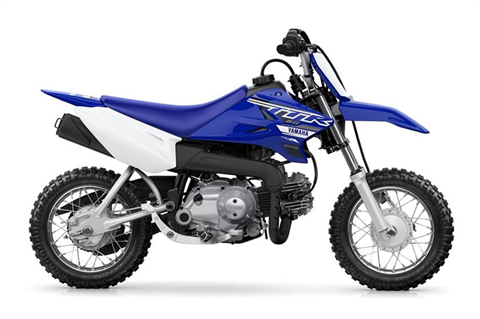 USEABLE, ENTRY-LEVEL MOTOR: 49cc air-cooled, SOHC powerplant puts out smooth, reliable four-stroke power perfect for kids and small novices. ADJUSTABLE RESTRICTOR: Throttle stop screw lets the adult supervisor restrict speed while beginners are learning. RACY STYLING: Cool-looking YZ bodywork includes an integrated front fender/number plate. FOLDING SIDESTAND: Standard sidestand tucks up out of the way when not in use. GRIPPY FOOTPEGS: Large, folding, cleated foot pegs provide excellent footing. CONVENIENT ELECTRIC START: The TT-R50E gets the same pushbutton electric starting feature as our full line of electric-start TT-Rs. ACCESSIBLE PERFORMANCE: Great for learning and/or playing, complete with 49cc of four-stroke fun feeding power through a three-speed automatic-clutch transmission. 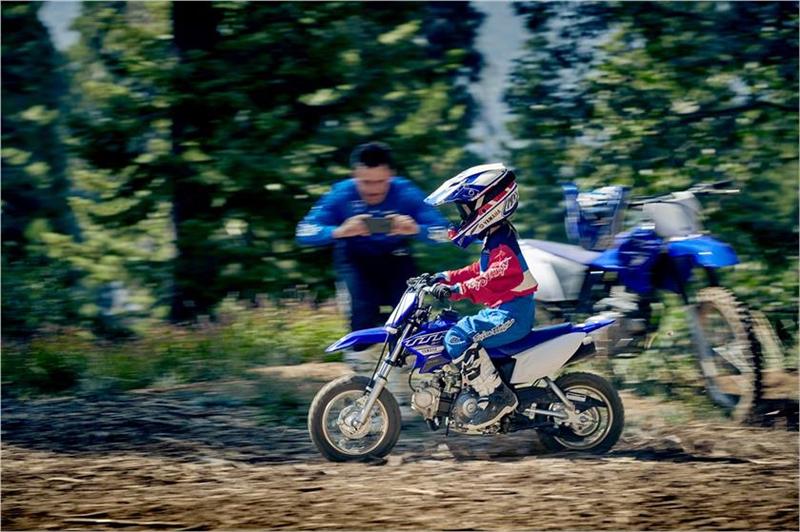 ULTRA-LOW SEAT HEIGHT: Big YZ styling meets little people’s stature; the seat’s only 21.9 inches from the dirt. 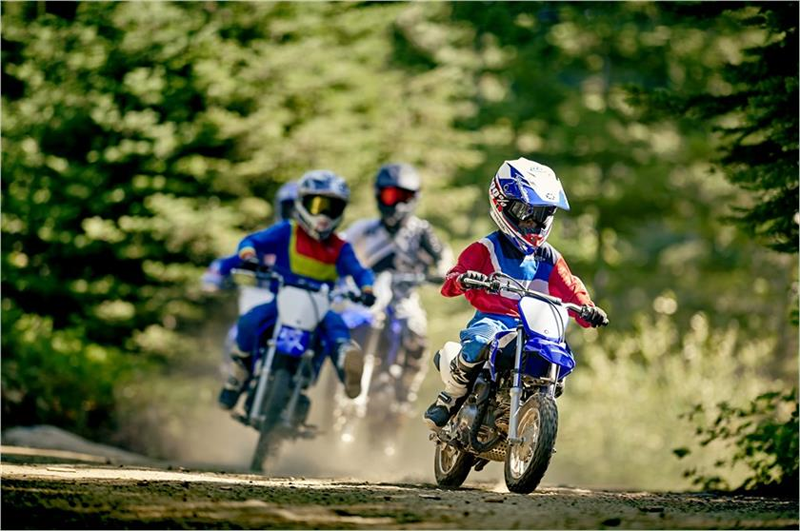 ADVANCED SUSPENSION: Inverted fork and Monocross® rear end provide great handling. ROBUST FINAL DRIVE: Large chain cover for maximum protection and minimal maintenance.